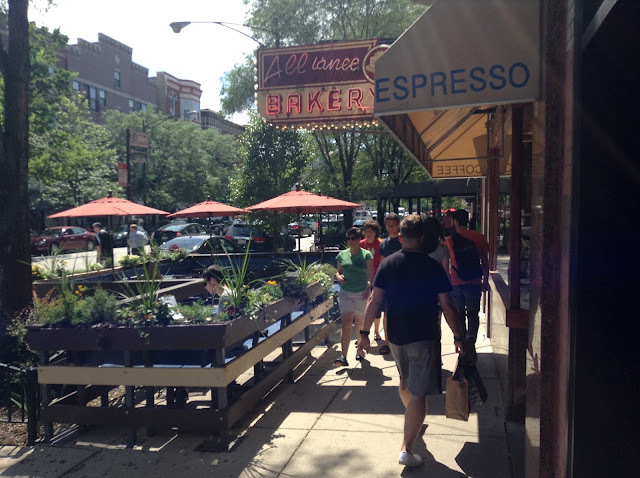 East Village Association | West Town Chicago: Will sidewalk cafes stay in the clear? Will sidewalk cafes stay in the clear? A stroll down Division Street could become an obstacle course without rules for sidewalk cafes. Even a tidy array of tables and chairs might over the summer creep into the path of pedestrians. The approved plan shouldn't be a mystery, though: The city requires exact dimensions and a seating count to be posted on the outside wall or in the window of each restaurant. However, on an informal East Village Association inspection, half the plans weren't posted. The rules make a sidewalk cafe easy to spot: They require a firm, continuous barrier that blind people can find with the tap of a cane. It should be unobtrusive: Cafes shouldn't play music, or stay open past midnight. Layouts make way for handicapped seating, with alternatives to high-top tables and barstools. And cafes should be pretty, with plants decorating the surroundings. The barrier should leave 6 feet of sidewalk clear, and restaurants should keep waiting patrons from blocking that walkway. Open doorways, bus shelters, parking-permit boxes and most other obstacles must get the same berth. The fence also should stop a foot from the curb, to give car passengers and pedestrians some room to move. A few cafes in the EVA spot check seemed to fall short on that measure. Restaurants that get cafe permits pay city fees of at least $600 a year, and require an alderman to sign off on plans. Ald. Proco Joe Moreno insisted that tree pits be restored where they'd been taken down at Red Square, 1914 W. Division St. Taus Authentic Food & Drink rebuilt two of four tree pits removed by the former Prasino restaurant, 1846 W. Division St., under a deal with Moreno to restore the others next year. Fines for cafe violations range from $200 to $500 a day, and three strikes against a restaurant can lead the city to revoke a permit. Restaurant staffers are instructed to keep the sidewalk clear, and the city makes occasional on-site inspections. EVA has discussed ways to contribute to a more walkable street, but a program to check cafe permits may not be the best use of volunteer time. Diners can do their part by keeping their neighbors' path in mind.